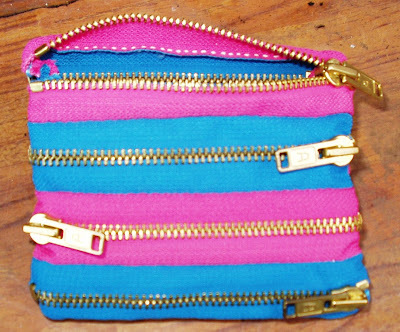 Talking of zips, here is another purse I made. This one has the seams on the inside, and has eight zips whereas the last one had six and the seams on the outside. I think I like this one better, plenty of room for cash and cards. 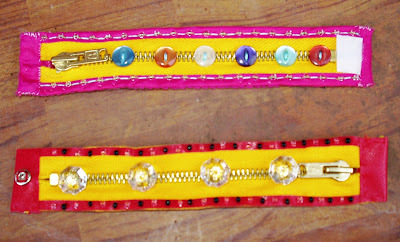 I have been trying to think of something else to make with zips, and came up with these pretty wristbands. The top one has a pink ribbon edging with beads added to the stitching, and small coloured buttons sewn onto the zip. I have used velcro for the fastening, it works well but looks a bit messy. The bottom one is edged with red vinyl strips, also stitched on with beads added. The glass crystals down the centre came out of a skip at work, they threw a lot of chandeliers away. I put a press stud on to fasten it, it looks better. Oh, I almost forgot, I made another shopping bag as well, out of the gazebo roof I mentioned before. I made the handles seperately for this one. The panel on the front is a piece of fused plastic bags, I wondered what to do with it, so I sewed it on with the machine with a zigzag stitch. The bag is strong, I just collected eight library books in it, my bags for life really will last a lifetime. My dinners keep getting bigger and bigger, sometimes I can only just fit it on the plate. What starts of as a few potatoes and onions, ends up a massive pile of veg falling off the edge, I just don't know when to stop. This is what I have just eaten. 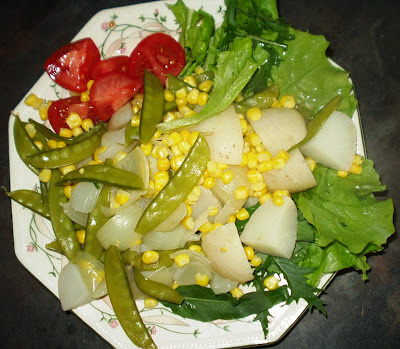 Potatoes, lettuce, and mangetout peas out of the garden. Reduced price out of date tomatoes, sweetcorn out of the freezer, and shop bought onions, all steamed in one pan, except the lettuce of course. Drizzled with Toasted Sesame Seed Oil, scrumptious. This is typical of my meal most nights, for anyone watching their weight you can eat as much of this as you like. I find it no effort at all to keep my weight down because I just love my big plates of veg. Another plus side is that it goes through you pretty quickly, you don't get that bloated feeling...like I did when I had the afternoon tea, definately won't do that very often. Processed food stays in your body far too long, it clogs up your arteries, makes fatty deposits around your organs then they can't function properly. I feel sluggish when I can't get enough veg, feel tired and sick if I eat the wrong things. When I'm on holiday I can't wait to get back and get my normal food, and of course this is a very frugal meal, a win win situation. Twas our village fete today on the green, literally two minutes from my house, very handy. 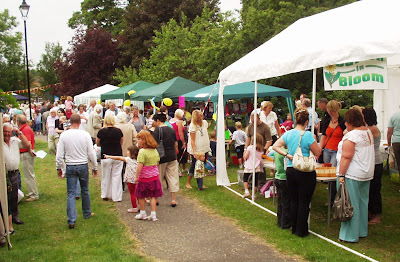 It's only a small fete, because we are quite a small village, never the less, most people turn out for it. I went along wearing my teeshirt emblazoned with Lindsey Lodge Hospice Sleepwalk all over it, back and front, a good opportunity to sign up some sponsors for the walk I am doing on Friday night. 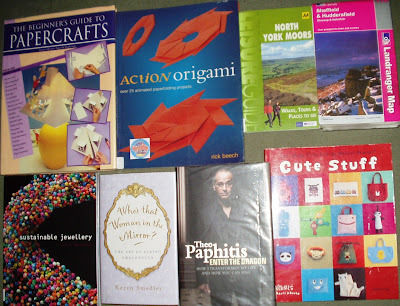 There is always a book stall there, and last year I found some crafting magazines for 5p each and bought ten. This year they had some more, but this time they were free, so I helped myself to ten, I didn't want to be greedy, so I left some for someone else. I was very pleased with my find, they have lots of craft ideas in them, and patterns to copy. 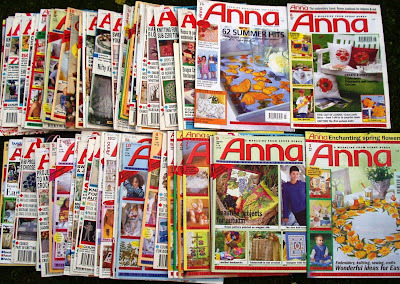 When I got home later, I found a carrier bag on my doorstep full of lots more magazines, how lovely, a very kind gesture indeed. I counted them, another sixty on top of the ten I already have. 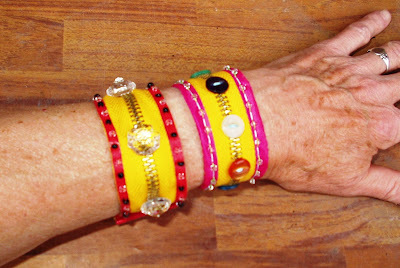 I am going to give some to my friend Becky as she is into crafting as well. 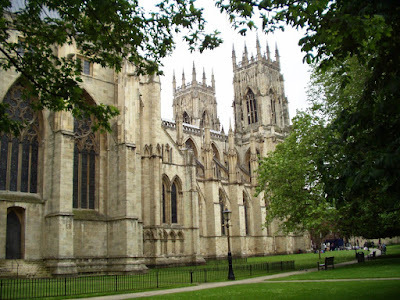 Today I fancied going to York. I looked at the bus timetables to see if it would be possible to do the journey on my bus pass. I would need to get a bus to Hull, change, then on to York, the journey would take three hours. Double that for the return, six hours on a bus didn't sound too exciting. 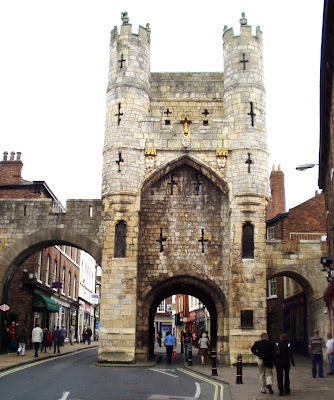 I chose the alternative, drive to the outskirts of York to the Park and Ride, time one hour, get a free 20 minute ride into town on the pass, much better. I only found one art gallery which was free to go in, all the other tourist attractions had quite a hefty entrance fee, so I decided I was quite happy to look at the outside of the buildings. 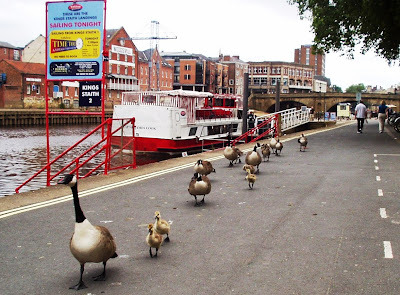 The river walk was very pleasant, ducks waddling along, people enjoying a drink and an ice cream, tour boats cruising and canoes racing. Here are a few pictures. Mummy and daddy ducks walking their babies, so cute. 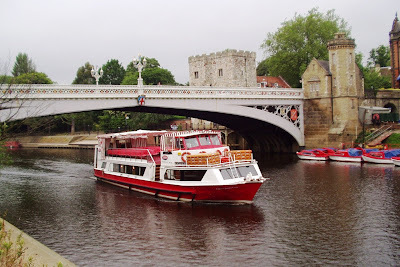 Tour boat passing under Ouse Bridge going back to it's moorings. The wall passes over the road at this point. 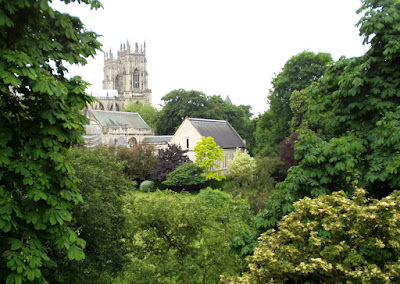 View of part of the Minster from the city wall. There is a lot of restoration work going on at the Minster at the moment, so some of it is covered with scaffolding, but I managed to get a few good shots. 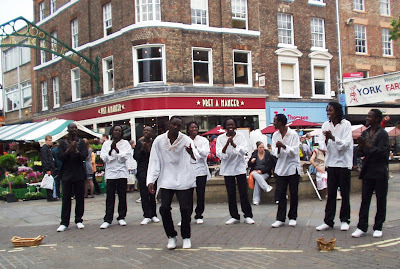 Street entertainment, singing and dancing. 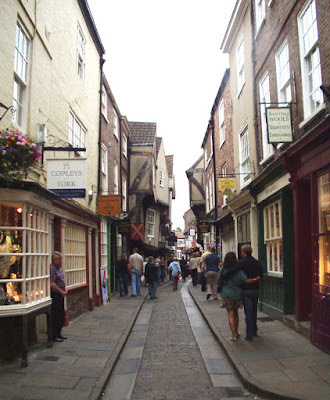 Shambles, the world famous shopping street where the upper floors of the building almost touch each other across the narrow street. This corner shop has the address No 1 Shambles. I am stuffed! I usually make my dinner at this time, 6.30pm, but I am still full up from my afternoon tea at Mrs B's Tea Shop here in the village. I wouldn't normally feed my face two minutes walk from where I live, but this was a freebie. I was given two vouchers for my birthday, so I invited my friend Irene to come with me. We were served with posh wholemeal bread triangle sandwiches, no crusts. Salmon and cream cheese, and egg mayo, and a large slice of homemade sponge cake. I had raspberry and cream filling and Irene had coffee icing. This was followed by two of the biggest homemade scones with lashings of cream and jam, delicious. All served on one of those three tier cake carousel thingys. I had apple and blackberry juice and Irene had a cuppa. Now I feel stuffed. Maybe I will skip dinner altogether. I was hoping to do my bit for my fellow men, or women, today, by giving some of my blood away. Off I went to blood suckers, ooops, I mean blood donors, waited in the queue because I didn't have an appointment, chatted to a nice lady, had a drink, then it was my turn. I handed my form over with all the questions answered and all the right boxes ticked, and the nice nurse pricked my finger and took a sample. This is put into a test tube full of pinky liquid to see if it sinks within the required time. Oh dear, the beeper went and it hadn't sunk. Then we moved to another table where she stuck a needle in my arm to take a bigger sample, I chuckled as I thought of Tony Hancock all those years ago in that classic comedy, The Blood Donor. The line, 'very nearly an armfull', is so funny. We waited while she did her stuff, and put my blood into a machine, the verdict, oh dear, not enough iron. She thanked me for coming and said they couldn't take my blood that day, because I need it more than they did. I must remember to drink a pint of Guiness before I go next time. 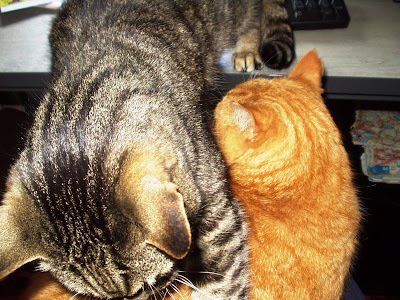 For all cat lovers, here are some pictures of my babies, they're old men actually. 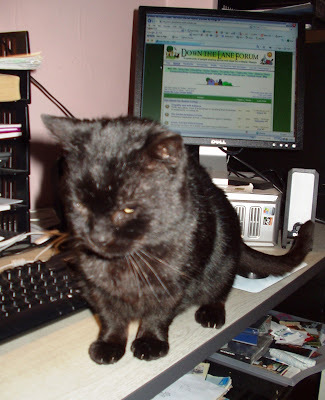 At the moment they are not very happy because they are getting the bog standard Felix food in pouches and foil, what they really want is Felix As Good As It Looks, but at over £4 a box from supermarkets, they will have to manage, because the market stall where I usually get it from has run out. I will not pay extortianate supermarket prices for it. Hopefully the market will get it in again soon, at £2.75p a box, a massive saving. They get dried food as well, but they are fussy about which brand they like. I tell them it's only a name, but they turn their noses up at the cheaper food, so they have to wait untill the good stuff comes on special offer. Bugsy in the sun. He came to me 12 years ago at 10 months old. He lived with someone who kept going off and leaving him to roam the streets. 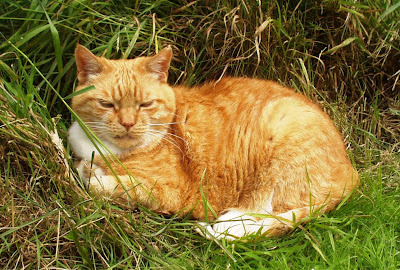 Just behind him in this picture is a patch of long grass in the middle of the lawn. I deliberately leave it long because they like to make nests in the middle of it and snooze in the sun. 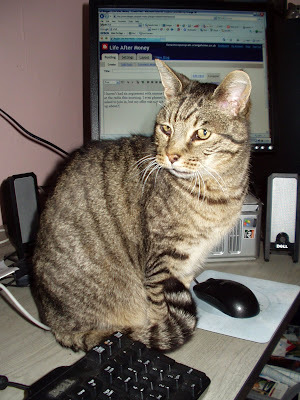 Lilly has been here about a year, he is 14 years old and came to live with me because he knows I am a soft touch where cats are concerned. Any cat can visit here, other cats just stroll in and out. I went to see Lily's other cat mum round the corner, they don't allow him in the house, that's why he likes it here better. Freddie is the bully, he thinks this is his patch and will see off any others he doesn't like. 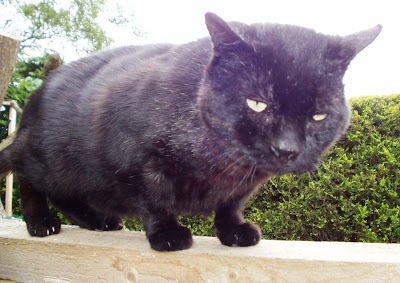 He arrived about five years ago, in a terrible state, lumps of fur missing, smelly and flea ridden. as an entire male he just had to be 'seen to', but it didn't cure his spraying, unfortunately he still does it, occasionally indoors. I have to have some of the furniture covered, and cleaning solutions at the ready. I still couldn't get rid of him though, even with his bad habits. Not sure how old he is, probably quite old. 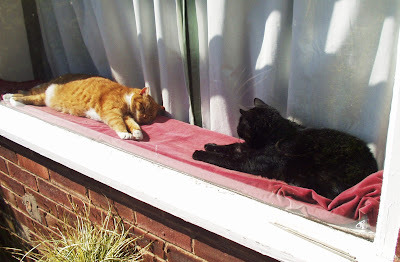 They love to lie in the window sill and sunbathe. Nearly finished. I hand the house and Henry over tonight around midnight, that's if their flight hasn't been delayed. 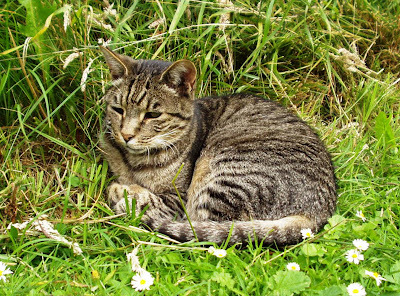 My cats have been missing me, lots to catch up on in my garden, feel like it's been ages, but it's only a week. Catch you later. Editing this to include the link to my clip on youtube. Not sure why it isn't working in my comment below. Just popped home to water my veg garden and wash the cats dishes, they licked their lips when I opened a tin of tuna fish for them as a treat. This is Henry, the dog I am looking after in the house sit. He is still a baby, but growing fast. We have had fun and games, he eats everything he can find so you daren't put anything on the floor. He has demolished the flower beds, chewed up a hard ball which I had to wrestle from him and bin it, then he was sick and is now feeling sorry for himself. Yesterday he decided that pulling the padded cushions to bits on the sun lounger was a good idea, foam everywhere. When he is hot he dives into the pond and looks so funny with all the green weeds over his face, such an innocent look, it wasn't me, makes me laugh. I can see this is going to be a nerve wracking week, I wonder what he is going to do next.Must get back, I hope the house is still there, ha ha. We all cut credit cards up when they they become out of date, or when we want to curb our spending. It's a shame to bin them because some of them are so pretty and have cute pictures on them. 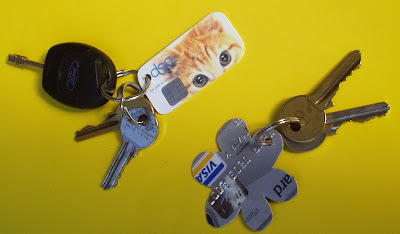 What about turning them into key fobs. I liked the cats face on this one but the writing went right across the middle of it, so I cut out the eyes, rounded the corners and filed them smooth with a nail file. I punched the outline of a hole in the corner with one of those gadgets which makes holes in leather. It wouldn't go right through so I carefully prodded the outline with the point of a sharp craft knife untill it came out. Using the same method with the barclaycard, I cut a flower shape into it. Easy to make, and free, that's if you haven't racked up lots of interest on the card before it reached the end of it's life, in which case you have paid for it. I'm off to my house sit now, catch up with you later. 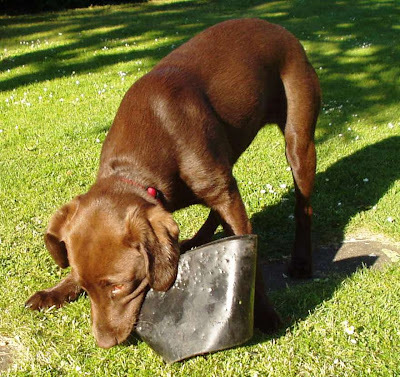 Here is the evidence, OK I admit it, I was caught on camera, stealing out of a big wheelie bin. Only joking, I was given permission to take anything I wanted, whoopee, I was in my element! 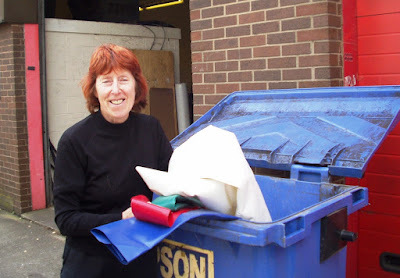 I was out and about with my friend Becky from the Scrapstore, looking for anything that might be usefull to us. The best way to approach this was to knock on doors, and ask if we could rummage through their rubbish, and we found people very helpfull, they wanted us to take stuff, to help cut their costs of sending it to landfill. This particular bin was full of vinyl offcuts, the company makes curtain sides for lorries and trailers, they are made to measure so they will always have an excess. The pieces were varying sizes, and all colours, I'm sure we will find a use for them. Another company is going to deliver some stuff to us, because we don't have a van, and someone else is going to save their broken tiles for us to make mosaics with. There is so much stuff going to landfill that shouldn't be, what we need are a lot more people to be creative and find new uses for these materials. Such a lot more could be achieved if only people reused and recycled instead of replaced. I don't care how much fuel costs, if I want to go out I will go out. 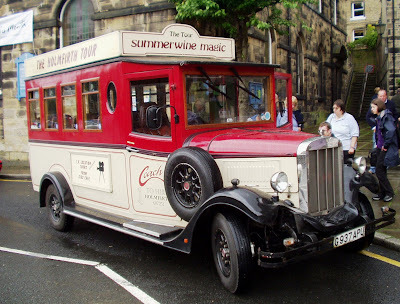 The bus pass comes in handy for free travel, but today I had the fancy of going to Holmfirth, home of 'Last of the Summer Wine', so it was the car, as it would have taken all day to get there on the bus. Seventy miles and one and a half hours, later I arrived at 11.30am. 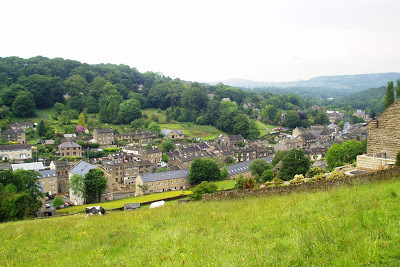 What a picturesque place it is, nestled in the valley just south of Huddersfield, exactly as you see it on the tele. 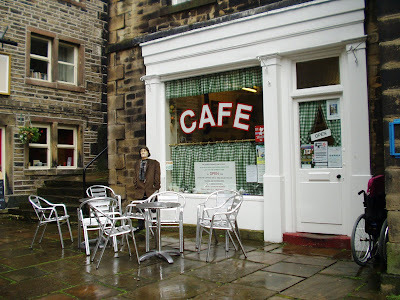 I thought Sid's Cafe would be a good place to start, there was Compo waiting for me. 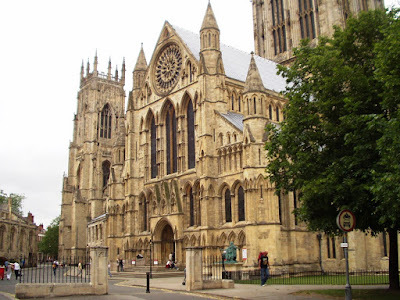 Sorry to say, I didn't go in, I sat on the bench outside the church opposite, and ate my sandwiches. Just outside is the starting point for the tour bus, and luckily it came along just as the rain came down. I got front seat for a good view and paid my £6. For fortyfive minutes we were taken up and down the narrow lanes, the driver did a comentary and told us some of the filming secrets. Everyone thinks all the houses in the programme are in the same village, but they are not. They are in several villages dotted around Holmfirth. When all the trucks come with all the equipment they are parked in a large park, and the actors and props have to be ferried around in small vehicles due to the width restrictions of the roads. Also some of the scenes are shot in the studios. Aunty Wainrights junk shop doesn't exist, it is a house made to look like a shop, and the cafe has to be changed to make the counter on the left hand side, but in reality it is only a wall. The scenes showing Ivy going into the kitchen are shot in the studios because there is no kitchen behind the counter. When we got back the rain had stopped and the sun came out, what luck! I set off for a walk up into the hills, I wanted to be high up and admire the views. The Ordnance Survey map was very useful, I did a circular walk following the footpaths. Here are a couple photo's. 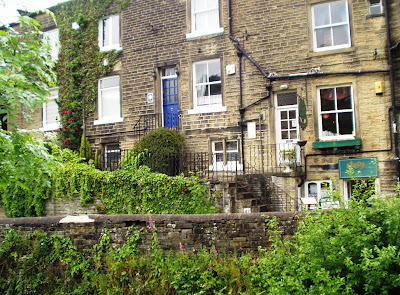 When you are in Holmfirth you have to go and see Nora Batty's cottage. Remember the railings around the balcony by the front door, well the the balcony is not very wide, so for filming they have to build an extension, like a wooden platform so everything can fit on it. Also they never show the top story of the building, in the programme it is a one up one down cottage, in reality it has three floors. 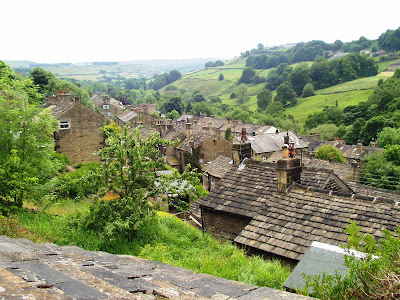 The people living in Holmfirth must be very fit, it is full of steep and narrow streets, some of which you can't take a car down. The only thing that spoils it is all the traffic going through it, it's a pity they don't have a bypass, but I am not sure where they could put one without blowing up millions of tons of rocks and destroying the beauty of the place. I'm going to be doing some house sitting soon, and looking after a dog while the owners go away. It's only in the next village, but it's a lovely house, I tell everyone I going to my cottage in the country, well you can dream can't you! It will be a nice change to watch the tele, I don't have one here, and I will be able to lounge in the bath, I've forgot what it's like to do that. They have a rowing machine and a cross trainer that I can use, so I will be fit by the end of it, hopefully. I've been to the library to stock up on books to take, and these are the ones I have chosen. Looks like something I might want to try. Some interesting ideas in here. I might go there, I love maps. Some amazing ideas for using junk. Changing beliefs about attitudes to ageing. How he became rich, should be interesting. Craft book with ideas and instructions. I called in at Tesco on the way home, and had a laugh with the girls on the till. I was joking that I had a bit more money now because my pension is more than my job seekers allowance, and I dont have to look for a job any more. My weekly shop came to £18, a bit more than normal! Mustn't get carried away, ha ha. Last year I picked up a gazebo roof at Peterborough Showground, which someone had discarded after a caravan and motorhome show. The trade stands leave their piles of junk lying around and I can't resist rooting through them to see what can be salvaged. The other day I got it out of my garage, spread it out on the ground, and cut it up into massive blue and white triangles, discarding all the seams. Although it was in quite good condition, hardly used, I scrubbed a blue piece with soapy water and hung it up to dry. It cleaned up nicely, now what can I make with it? I tested a small piece to see if it would go through my new sewing machine without breaking a needle, and if the stitching would be strong enough to hold a bag together without tearing. It looked fine to me. 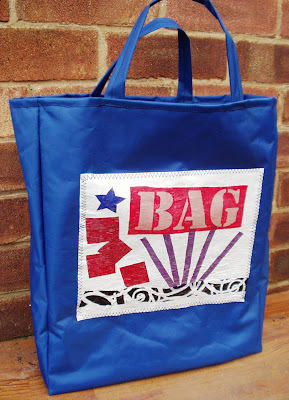 Next get a carrier bag to use as a pattern, lay it out on the floor and cut round it. A bit of decoration would be nice. I used a stencil to cut some letters out of the vinyl offcuts I have, and stitched these on first. Then sew up the sides, and make a fold in the bottom to give it some width, copying the plastic bag. 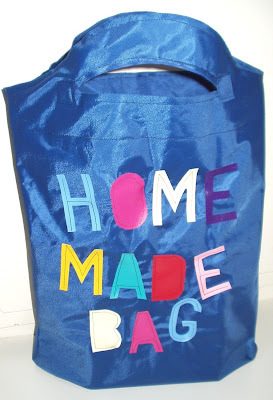 Next I cut two pieces matching the shape of the handles and stitched them to the inside of the bag to reinforce them. Here is my bag, I know the letters are higgledy piggledy, and the sewing is not perfect, but I think this adds to the fun of the bag. It is obviously home made, a message I am proud to convey to others at the supermarket. The cost? Nothing. What a pain this pen holder was to make! 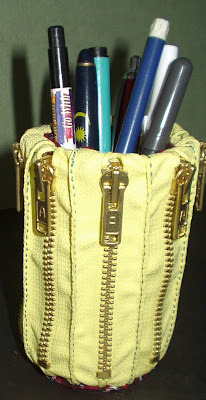 I'm still thinking of ideas for the thousand zips we have at the Scrapstore, though I don't think I will be making any more of these. Take eight, 4inch yellow zips, sew them all together with running stitch with contrasting thread, seams on the outside, all the same way up. Then you have to close the gaps at each end of the zips by sewing them together neatly on the inside with same colour thread. Very fiddly, makes your fingers sore, I used a pair of pointy pliers to pull the needle through the tough edges of the zips. Get an empty tin can, washed out, cut two circles of fabric, and one oblong piece for the inner lining. Sew one circle to the zips for the bottom, seam inside. Sew up the side seam on the oblong piece, then sew that to the other end of the zips. You have to put the zip tube inside the lining tube, so the seam is on the inside. Pin it in place and sew. Now you have a long tube, turn it the right way round, then put the can into the tube. This is where I came unstuck. I thought I had measured it to fit snugly over the can, but my stitching round the top edge was a bit too tight, which made it a fraction too small for the can. I tried for ages to get the can inside. Admitting defeat, I did not want to unpick it and sew it up again more loosely, so I used an aluminium drinks can which is slightly smaller, cut the top off. Because the can is now a lot lighter, the zips make it top heavy, so I found some washers in my bit box and stuck them in the recess in the bottom to weight it down. Now the lining is too loose so I put four vertical darts in it, then stitched the inner circle on. I'm still not 100% happy with it, because the zips should have been a tighter fit around the can, but it will do as an example at the Scrapstore, maybe give people ideas. Just want to get on with something else now! It really anoys me when you get a small item which is lost in vast amounts of packaging. I got this sample of wrinkle filler free in a magazine, it says it will fill my wrinkles in 30 seconds, the tube is three inches long, blimey, I will need a lot more than that :-) But look at all the cardboard it came in! Even if I could afford the product I would not buy it, as most of the money would be for the packaging and not for the cream itself. 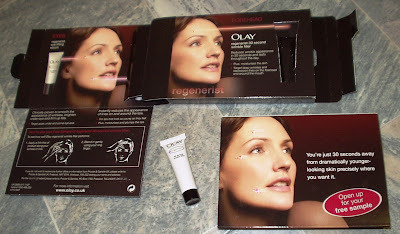 I don't believe it would work anyway, I would rather fill my wrinkles with some aqueous cream from my £1.49 tub. My name is Ilona, and I'm a scrapoholic, is there no hope for me! I went to Hull again today, a free ride on the bus, but I only went to the Scrapstore, not the city centre this time. It is housed in an old junior school building, and a lot bigger than our Scunthorpe store. It was a hive of activity and I was made very welcome by the volunteers. Tracey is paid to work 16 hours a week, and it is her job to drive the van and go out and collect the scrap from businesses. 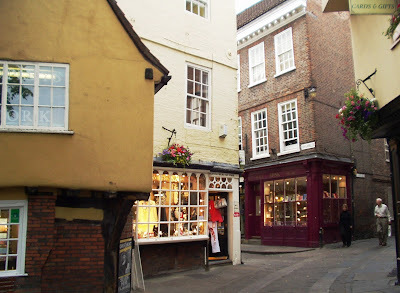 While I was there they had a steady stream of customers, from individuals looking for materials for their own crafting hobby, to group leaders collecting for their club projects. It was great to have a root around and of course I had to pick up some items for myself to play with. 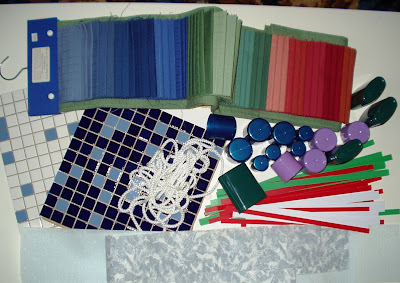 There's ceramic tiles, fabric samples, plastic tops and strips, cord, and some kind of plastic coated fabric, (I can't tell what it is). Now what can I make with these?